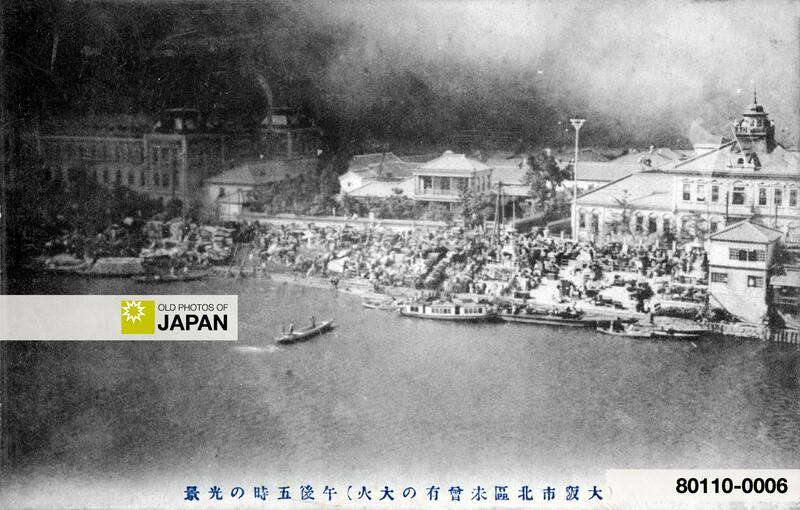 On July 31, 1909 (Meiji 42) a fire broke out at a knit-wear factory in the northern part of Osaka that would eventually engulf 122 ha. of the city and rage for no less than 24 hours. One of the most scary moments of the day happened around 5:00 PM when thousands of refugees found themselves in front of the Osaka Court of Appeal, trapped between the Dojima River and the rapidly approaching flames. The photographer caught this dramatic moment in this image. The dark smoke of the fire can be seen over the court building, barely visible on the left, while a crowd with all their belongings is in front. All the buildings in this image would soon be reduced to ashes. Four employees of the court couldn’t escape in time and were killed in the fire, but the people along the river did manage to escape. Albeit without the household goods they had tried so hard to safe. They had to leave all their belongings behind. Later, from a safe distance, they helplessly watched them burn on the quay. This photo was later sent around the country as a postcard. Postcards in those days fulfilled the function that the news media have today. Japanese newspapers did already carry photographs at this time, but they were not so large yet. Thanks to that custom, however, we can now once again shiver with horror as we contemplate the fate of the court employees who must still have been alive when the photographer made this shot. A map showing the area devastated by the fire (colored dark), published in the Asahi Shimbun of August 2, 1909 (Meiji 42). 1. Osaka Station; 2. Shijimi River (later filled in with the rubble); 3. Oebashi Bridge connecting Dojima with Nakanoshima (the bridge was burnt down in the fire); 4. Osaka Court of Appeal; 5. Dojima River and Naniwabashi Bridge; 6. Origin of fire. 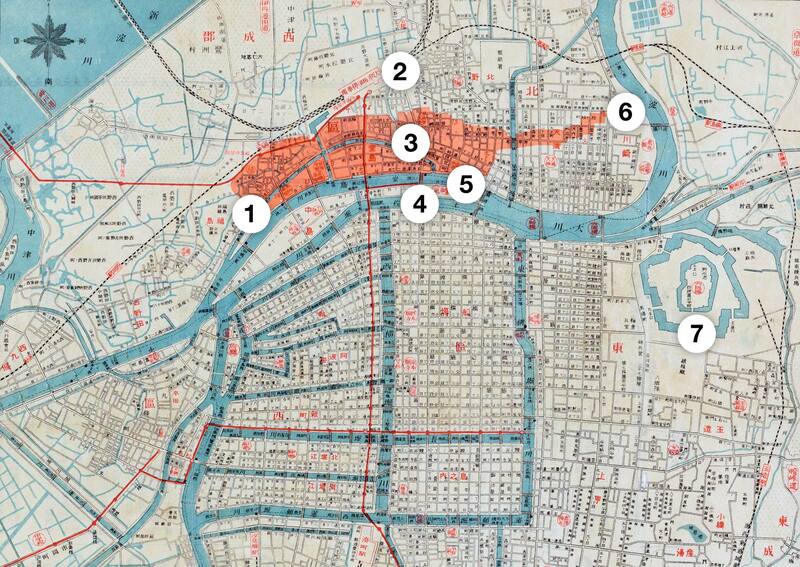 For more information about this devastating fire, read Osaka 1909 • Great Kita Fire. The Google map shows the current location of the court. You can also licence this image online: 80110-0006 @ MeijiShowa.com.